Love dolphins and dugongs and love being out on the water? 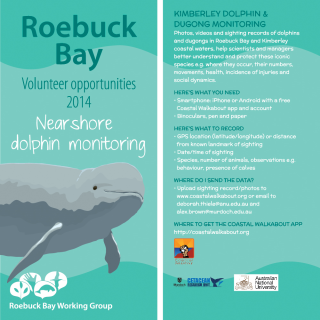 Well here is your chance to contribute by uploading photos and sightings of dolphins and dugongs in near shore waters along the Kimberley coast to a dedicated website? 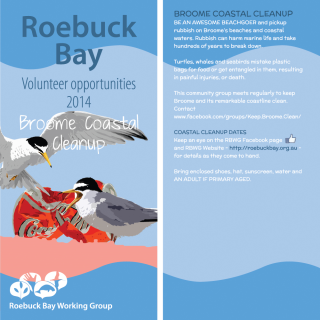 The Roebuck Bay Working Group has developed these wonderful cards that illustrate so beautifully, coastal projects being run by scientists such as Dr Deb Thiele and PhD researcher Alex Brown, that are in need of volunteer help. Want to be a volunteer who helps keep Roebuck Bay and its remarkable coastline clean – well you can do this by joining a local group that has a ball picking up rubbish and making Broome a healthy and happy place for people and marine life.